Southern Armyworm identified in West and Central Africa! This introduced second armyworm species from the Americas was first found in cassava fields in southeastern Nigeria in December 2016, reported Georg Goergen, Entomologist/Biocontrol Specialist and Head of IITA’s Biodiversity Center in Bénin, but its presence was only recently confirmed by DNA barcode analysis at IITA headquarters in Ibadan. The recent introduction of the fall armyworm (FAW) into the African continent and its growing threat to agriculture and food security have caused great concern in many of the 44 countries of tropical Africa invaded by this pest. Originating from the tropical regions of the Americas the FAW adult has a remarkable capacity for long distance migration and high female fertility. 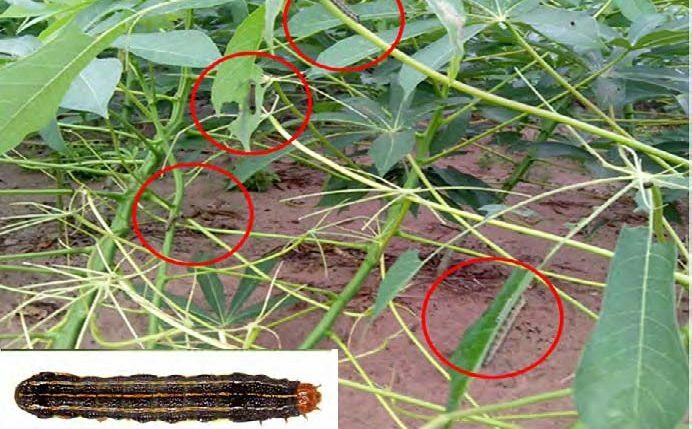 Its crop-destroying caterpillars can cause serious damage to maize but also to other important crops such as sorghum, rice, and vegetables, making the control of FAW a challenging task. 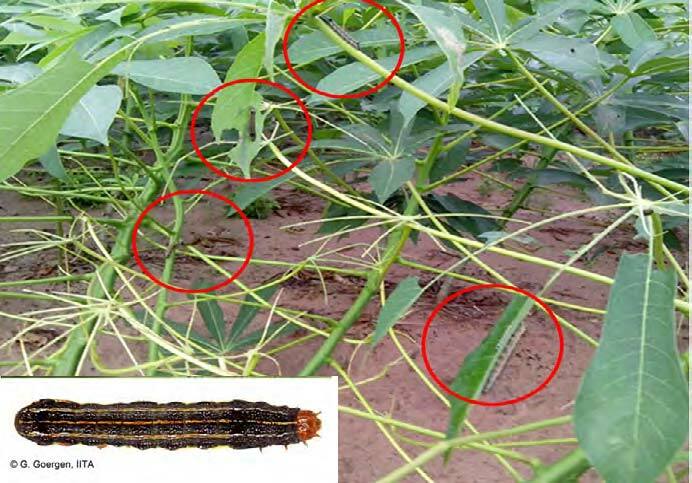 The development of management options adapted to Africa has mobilized international experts and the national capacities of affected countries and raised general attention to caterpillar attacks on various crops. Moths were finally obtained from tomato fields attacked in Yaoundé, Cameroon, and samples of adults were obtained from a scientist-colleague based at the University of Masuku, in Franceville, Gabon. The examination of the outer features of the moths together with the genitalia of both sexes clearly identified the pest as SAW. Larval and adult samples were also collected and sent to IITA headquarters in Ibadan to the germplasm health, virology, and diagnostics unit for DNA barcode analysis. Results confirmed these findings. The southern armyworm is native to the Americas, occurring widely from southern USA to Argentina. In Africa, spectacular outbreaks comparable to those caused by FAW have not been observed; however, preliminary data show that the species is present in at least four countries in West and Central Africa, where it can be found on cassava, tomato, amaranth, and maize. It is uncertain how long the SAW has been present in West and Central Africa and its possible pathways of introduction into the continent are also unclear. Since their identification is difficult, populations may have remained latent in the field and only been sporadically noticed especially when young caterpillars aggregate on individual host plants before they disperse upon maturation. An interesting circumstance is that the southern armyworm and the fall armyworm share many important natural enemy species in South America. IITA’s Deputy Director General for Research for Development, May-Guri Saethre, said that while this trait may become a significant stabilizing factor for common natural enemy populations, more research is urgently needed to assess its effective pest status in tropical Africa. From IITA media release: New pest identified in West and Central Africa!